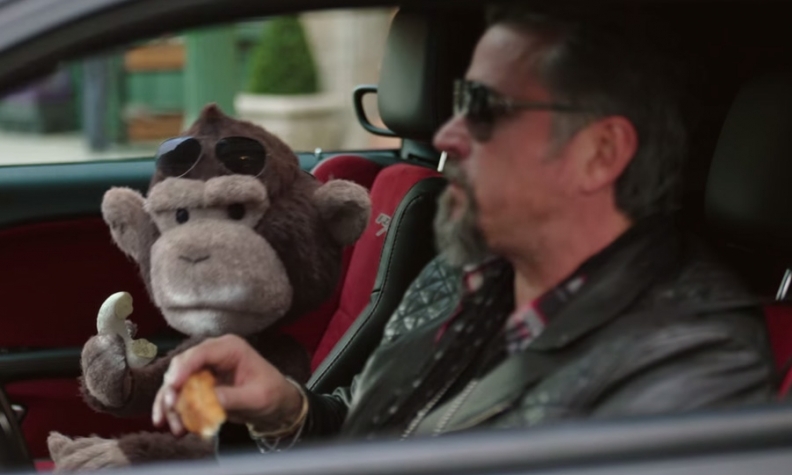 Richard Rawlings of Discovery Channel's “Fast N' Loud” and his sidekick, Gas Monkey, star in Dodge's latest campaign. Enforcing Dodge Law is serious business. So the brand turned to muscle car enthusiast Richard Rawlings of Discovery Channel’s “Fast N’ Loud” to restore order in an ad campaign that launched this month. But even with Rawlings’ expertise in resurrecting vintage rides at his Gas Monkey Garage in Dallas, he needed a partner with a little attitude. Enter the Gas Monkey, his no-nonsense sidekick. Rawlings and his computer-generated pal bust drivers for numerous “offenses” in four commercials that are running across the country, including “possession of a fancy pastry in a Charger” and wearing bronzer while driving a Dart. The ads are aimed at getting people into dealerships right away instead of building emotional connections like the “Dodge Brothers” campaign or the “Wisdom” spot that ran during the Super Bowl after being a viral hit last year, said Olivier Francois, global chief marketing officer of Fiat Chrysler Automobiles, in an interview. Using a CGI, or computer generated imagery, character in a commercial is new ground for the automaker. Tippett Studio, the animation company that brought a wisecracking teddy bear to life in the 2012 movie Ted, developed the monkey with Dodge in a process that took around four months. Francois said he enjoyed watching how the monkey was gradually integrated into the commercials, going from basic animations in early edits of the spots to realistic movements. While the commercials are cute, it isn’t all fun and games. Francois said the campaign’s goal is to increase consideration by highlighting key attributes in the Dodge lineup, whether it’s the Challenger’s Hemi V-8 engine or the Durango’s seating for seven. Dodge first worked with Rawlings last year in several spots in spring and summer sales pushes, which Francois credits with helping Dodge become the most searched automaker from July through October on Google. Rawlings’ passion for muscle cars and huge following made him a natural choice for Dodge. The Gas Monkey Garage Facebook page has 2.6 million fans, while Rawlings himself has a Facebook fan following of 1.1 million. The viewership for “Fast N’ Loud” episodes on the Discovery Channel, among the highest-rated TV shows among men ages 25 to 54, often reaches 2 million. In November, Rawlings hosted a loyalty event for Charger, Challenger and Viper drivers at his Gas Monkey Live concert venue in Dallas. Heavy metal band Motley Crue performed during the event. So what about Rawlings’ furry new partner? Francois isn’t sure what the future holds for the Gas Monkey, but he’s leaving the door open for a return if the monkey becomes more popular than expected.